A set of 28 tiny footprints have been found on a boulder in the Grand Canyon. 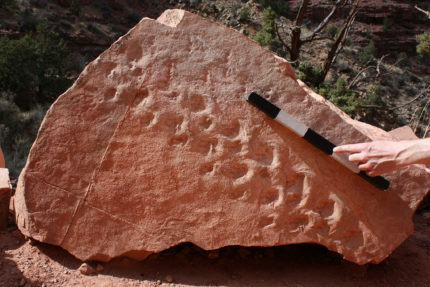 They were left by a reptile-like animal 310 million years ago, making them the oldest known footprints ever discovered at the Grand Canyon National Park. They are among the oldest tracks discovered on earth, period, impressed on the rock when the supercontinent Pangaea was still in the process of forming. They were found in spring of 2016 by a paleontologist and a group of students who were hiking up the the Bright Angel Trail. The boulder had been part of a cliff above the trail. When the cliff collapsed, the boulder fell onto the trail and cracked open. It broke apart along an inner seam revealing a naturally molded trackway more than three feet long. The paleontologist alerted park officials and his friend and colleague University of Nevada, Las Vegas geologist Steve Rowland. Park crews moved the rock to the side of the trail where Rowland first checked it out a year later. In March of this year, he returned with San Diego State University geologist Mario Caputo to study the footprints in more depth. When he arrived home, he made detailed drawings and began hypothesizing about the “peculiar, line-dancing gait” left behind by the creature. Caputo and Rowland continue to study the trackway and hope to learn more about the animal. Caputo is focusing on the sandstone itself in the hopes of discovering the topography of the sand dune that captured the prints and became a boulder. It’s possible the rock will have indications of whether it was the crest of a dune or a valley between them, information that would be key to understanding the reptile’s gait. It’s also possible that the creature who left the tracks is a previously undiscovered reptilian species. At this time, the tracks cannot be identified as belonging to a specific animal. The boulder is still on the trail. Rowland, who will publish the find in January 2019, hopes the trackway will be removed to the protection of the geology museum at the Grand Canyon National Park where it will be kept safe from the elements and predatory humans as well as be easily accessible to researchers. This entry was posted on Monday, November 12th, 2018 at 11:29 PM	and is filed under Ancient. You can follow any responses to this entry through the RSS 2.0 feed. You can skip to the end and leave a response. Pinging is currently not allowed. To me, that cute little critter was clearly –and very carefully– descending, i.e. not climbing. Note that whenever I descend myself, it looks very similar. P.S. In case of headwind I do usually do not go sideways. I’m no scientist, but judging from the claw marks in the tracks it looks like this creature was going straight, not sideways. If it had gone sideways, the claw marks would point a different direction. Also, at the top of the scale stick, it looks like some other kind of creature walked across that spot, too. “a naturally molded trackway”: I have not the first idea what that means. How about a horny lizard hot on the tail of a not so horny lizzie?